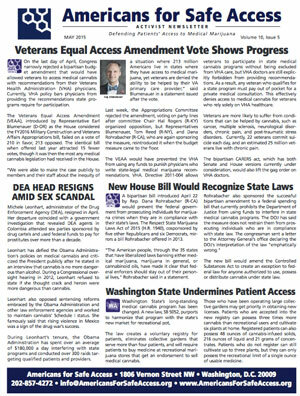 For recent developments affecting medical cannabis patients and advocates, check out ASA's latest Activist Newsletter. In this month's issue, you'll learn what happened in Congress with the vote on equal access for veterans and a new bill to respect state medical cannabis laws, as well as the resignation of the DEA head and what you can do to help replace her with someone who respects medical science and state law. On the state front, new developments in New York, Washington State, Pennsylvania, and California are affecting patients, and you can see what a group of moms in Pennsylvania did to inspire legislation and earn recognition as ASA's action group of the year. Read all about it now.